We all love to make yams for Thanksgiving, but did you know that you are actually eating sweet potatoes? In the United States we refer to an orange fleshed sweet potato as a yam, but they are really two completely different species. The true yam does not grow in the northern hemisphere. They are only grown in the Caribbean, Africa and parts of Asia. 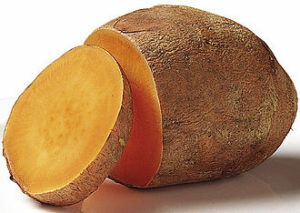 The Yam can grown up to 150lbs and 4.5′ in length. Their flesh ranges in color from white to yellow to pink and they have a very thick, scaly, alligator like skin. Their flesh is also very starchy and dry. Yams are more closely related to lilies and grasses than they are to sweet potatoes, which are in the morning glory family. Sweet potatoes are native to tropical regions of South America. 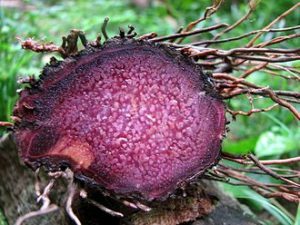 Peruvian sweet potato remnants dating as far back as 8000 BC have been found. You can eat them raw, baked, boiled, steamed, roasted, broiled, grilled, fried and just about any other way you can think of! prepared almost any way. It is very sweet and has a nice creamy, velvety texture when cooked. to be a little sweeter than the Garnet. I like to use the Beauregard in my sweet potato pie recipe. making sweet potato fries or chips! Hannah sweet potato pie with cardamom and vanilla. 350 degrees until they soften and turn a golden brown color. They are also nice in soups.